International Partnership for Education Representatives of College the Mainland, the Mexican Consulate in Houston, and student scholarship recipients acknowledge receipt of a $28,000 grant from the Consulate. From left to right: Trustee Alan Waters, Trustee Melissa Skipworth, Trustee Don Gartman, Consul General of Mexico in Houston Oscar Rodriguez Cabrera, COM President Dr. Warren Nichols, student Bellanira Arteaga, student Kimberly Vega, COM board chair Kyle Dickson, COM Foundation Executive Director Mary Ann Amelang, Trustee Bennie Matthews, and Trustee Rosalie Kettler. 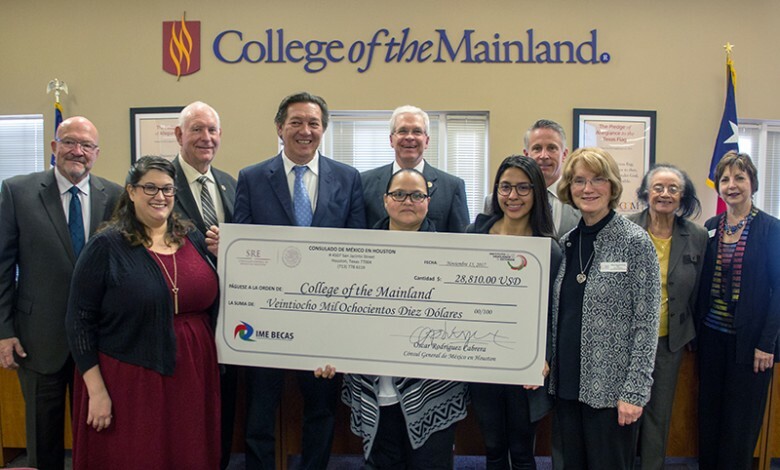 The Consul General of Mexico in Houston paid a call on the College of the Mainland board of trustees recently, presenting the college a check of $28,810 for scholarships benefitting COM students who are Mexican nationals or of Mexican origin through the IME-Becas program. “Thanks to the partnership with the College of the Mainland Foundation, this generous donation provides significant support towards funding tuition, fees and books for students beginning in the current spring semester, as well as testing fees for student’s in the COM’s adult education program,” said COM Foundation’s Executive Director, Mary Ann Amelang.